Minnesota Vikings defensive lineman Ray Edwards made his professional boxing debut Friday night by scoring a unanimous decision over Duluth’s TJ Gibson. Edwards scored a pair of knockdowns in the 4 round bout which was held at Grand Casino Hinckley. Scores from the judges cards read 40-34, 39-35 and 40-34, all in Edwards favor. Several of Edwards’ Vikings teammates were on hand for the event including Kevin and Pat Williams and Tavaris Jackson. Edwards has indicated that he is interested in a pro boxing career if things don’t work out in football. He may get his wish with the NFL lockout/strike now in its second month. Leave it to the sport of professional boxing to always make things interesting. 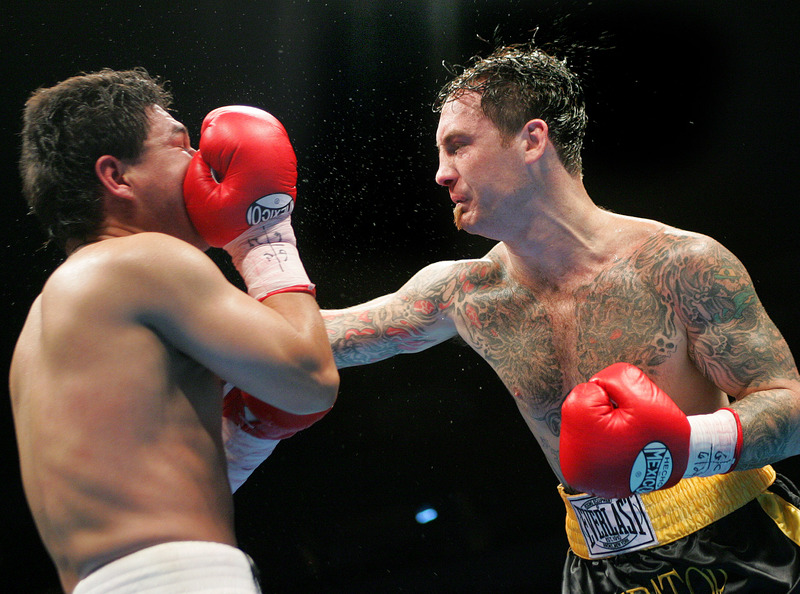 Saturday night at Target Center, an 8-bout fight card was highlighted by the return of retired former champion Tony Bonsante in a bout with Bobby Kliewer…and a much anticipated rematch between Matt “The Predator” Vanda and Phil “The Drill” Williams. Neither of which turned out very well for the big-name draws Saturday. Bonsante, fighting for the first time in two years, lost an 8-round split decision to Kliewer, losing by just one point on the third judges card. That point was one that was taken away from Bonsante in the 5th round for picking Kliewer up and throwing him to the mat. Bonsante was knocked down twice in the second round, before scoring a knockdown of his own in the 4th. He went down again in the 6th. As for Vanda, his 10-round bout with Williams was changed Saturday afternoon to a 6-round exhibition as a result of a suspension from a drug test that Vanda had failed in New Jersey last month. Vanda’s suspension was supposed to have begun later this month, but at the last minute was changed. In a state bantamwieght title fight, Brad Patraw of St. Paul got a unanimous decision over Antwan “Superman” Robertson in a 6-round preliminary bout. Patraw ran his record to 7-and-3 with the win. Other winners on Saturday included Jamal James (3-0), Tony Lee (2-0), Bobby Butters (1-1) and John Jackson (16-1, 13 ko’s). Rochester heavyweight Rafael Butler went down hard near the end of the first round of his state heavyweight championship bout against Joey Abell Friday night at Target Center. Butler got up, but went down even harder after the round when a confused Abell pummeled the unsuspecting Butler after the bell. Ringside officials awarded the victory to Butler on a disqualification of Abell for hitting Butler after the bell. Both corners charged the ring and a melee ensued for a short time before order was finally restored. The two boxers graciously hugged afterwards announcing that they would fight again and that Abell’s punches were unintentional. In the co-main event Duluth’s Zach “Jungle Boy” Walters was overwhelmed by Canada’s Larry Sharpe. 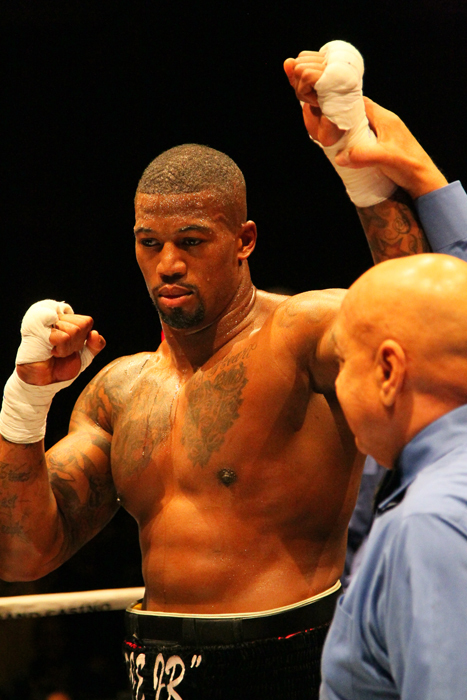 Sharpe scored a first round TKO, winning the fight in just 56 seconds. BILOXI, Miss. 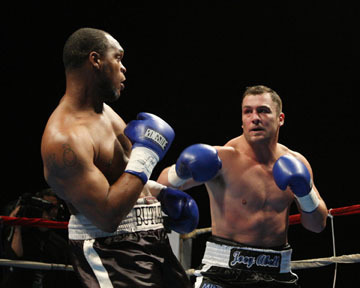 (August 9, 2009) – Two promising lightweight prospects, Jason “American Boy” Litzau (24-2, 20 KOs) and Verquan “The Show” Kimbrough (21-1-2, 7 KOs), open-up the “Hook City” pay per view this show Saturday night (August 15), headlined by 8-time world boxing champion Roy Jones, Jr. (53-5, 39 KOs) and 2-time super middleweight world title-holder Jeff “Left Hook” Lacy (25-2, 17 KOs), in one of four title fights airing live from the Mississippi Coast Coliseum in Biloxi. Litzau and Kimbrough square-off in a 10-round bout for the vacant NABF title in a much-anticipated showdown that has the potential to be the Fight of the Night. Kimbrough is trying to get where Litzau, who has fought for a world title, has been and plans to return. The “Hook City” pay-per-view show, presented by Square Ring Promotions in association with Left Hook Promotions and Beau Rivage Resort & Casino, is being distributed by Square Ring Promotions, Inc. at 9:00PM ET/6:00PM PT in the United States on cable and satellite via iNDemand, TVN, DirecTV and Dish Network for a suggested retail price of $34.95, as well as on Super Channel in Canada. Litzau, fighting out of St. Paul (MN), has already tasted what it’s like to be in a world title fight having lost to IBF featherweight champion Robert Guerrero 1 ½ years ago. Like Kimbrough, the flashy, 26-year-old Litzau was a standout amateur, winning 125 of 135 matches, including a gold medal in the National Silver Gloves Championship, later earning a spot on the 2001 U.S. National Boxing Team. MINNEAPOLIS, MINNESOTA (April 18, 2009) St. Paul’s Matt “The Predator” Vanda (40-9, 22 KO‘s) won a majority decision Saturday night at Target Center outpointing Tocker Pudwill in an 8-round middleweight bout. Vanda’s win was part of a 6-fight card that also featured Wilton Hilario’s 5th round TKO of Allen Litzau Hilario’s win earned him the IBA America’s Featherweight title and bragging rights over his long-time nemesis. Other winners on Saturday included Litzau’s younger brother Jason Litzau (24-2, 20 KO’s) who returned to the ring after a one year absence and beat Phillip Pane (16-23-1) in a 4th round TKO. Earlier, Jon Laboda remained unbeaten (5-0) taking out Patrick Cape. Cerreso Fort also remained unbeaten as a pro beating Bobby Kliewer while welterweightt Donny Tierney was a winner in his pro debut beating Zach Schumach in a 4-round decision.